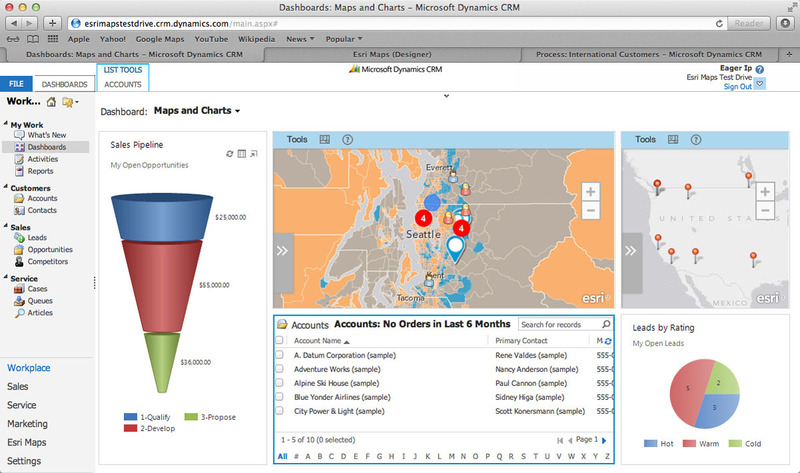 Esri Maps for Microsoft Dynamics CRM adds a location perspective to business information. Redlands, California—Esri today announced the release of an enhanced Esri Maps for Microsoft Dynamics CRM. The software adds new analytical perspectives for retailers across the omni-channel. From a single store to the entire supply-chain, users can collaborate to author and share analytical intelligence on customers, stores, products, markets, and the competition with a wealth of demographic data for 120 countries. Esri Maps adds new location-oriented workflows that uncover hidden trends and patterns with interactive tools, data, and analysis. Now, Microsoft Dynamics CRM users can author maps and interactive infographics from their internal information resources. These interactive visualizations and analytics uncover customer intelligence and operational knowledge. The geographic data and tools can then be shared with anyone via intelligent online maps and apps on Esri’s ArcGIS Online. For more information, see Esri in the Microsoft booth at the National Retail Federation (NRF) conference in New York, January 12–15, 2014. To request a live demonstration and find the perfect solution for your company, e-mail retail@esri.com.